Funding is always a hot topic in local authorities and schools and nowhere more so than in special educational needs. From this month, April 2017, the Department for Education is requiring all local authorities to set up a local SEN inclusion fund. This will entail pooling funding from their early years and/or high needs funding blocks to spend on support for children with “lower level or emerging” SEN. The DfE expects local authorities to use this funding to top up provider funding on a case-by-case basis. It will allow councils to decide for themselves which children with SEN should be eligible for inclusion funding. 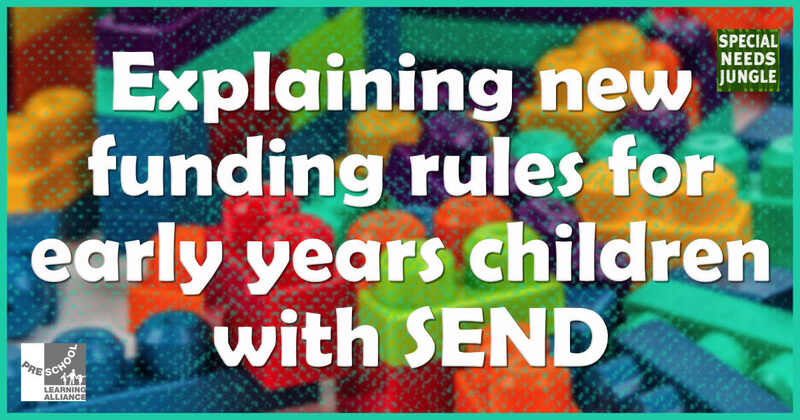 This is such a complicated area that, to help explain it, Nicola Gibson, inclusion manager at the Pre-School Learning Alliance, has written for SNJ about how funding for early years children with SEND is changing. Last December, the Department for Education (DfE) finally outlined changes to the three- and four-year-old early years entitlement and national early years funding formula, which came into effect on 1 April. The new arrangements include long-awaited changes to the funding provision of special educational needs and disabilities (SEND). These include the introduction of a disability element to the local authority’s funding base rate, a SEND Inclusion Fund and a Disability Access Fund. Unlike schools, childcare providers do not have a notional SEND budget. They must meet the needs of most children using their core budget. However, if a child’s needs cannot be met from that budget, and they do not have an Educational Health and Care plan, providers can request a top-up from their local authority. Eligibility criteria for this top-up was previously determined by a set of local SEND descriptors, with school forums overseeing the process and determining the outcome of applications. Previously, some local authorities have used their high needs funding block to provide this support. This block is one of the three main education funding sources, alongside early years funding and schools funding. This process has now changed. All local authorities are now required to provide an early years SEND inclusion fund. This fund will be created by pooling an amount of funding from either one or both of their early years and high needs funding blocks. However, some early years settings have raised concerns about local authorities who previously funded support for SEN provision through their high needs block, but now plan to source the inclusion pot solely from the early years funding. They warn that this means that the overall early years base rate in those areas is being reduced so that, in some cases, the 'extra' SEN inclusion funding is essentially being negated, with childcare providers seeing no net gain in funding. The Alliance has raised these concerns with the Department for Education and is currently gathering information on local authorities where this issue has arisen. If this is a concern in your area, please contact me. New funding reforms also introduce a new Disability Access Fund (DAF) of £12.5 million – equivalent to £615 per child per year – to support access to the free entitlement. This fund will support three- and four-year olds who are using this entitlement and are in receipt of Disability Living Allowance (DLA). Childcare providers will need to declare eligible children using a parental declaration form in order to initiate the funding process. The local authority will check the validity of the declaration using a copy of the parent’s DLA award letter. Parents can claim for DLA if their child needs more care, attention or supervision than a child of the same age who isn’t disabled or has difficulty walking or getting around outdoors in unfamiliar places. Applying for DLA can be a difficult process and so parents may require support from their childcare provider to do so. Some local Citizens Advice Bureaux offer this service, but guidance can also be found on the Contact a Family website. Each local authority will have a slightly different approach to all of these changes. Details about funding provision for children with SEND will be made available within the local authority’s Local Offer pages online. For more information on the early years funding reforms, please visit the Pre-school Learning Alliance website. Gov.uk: Claiming DLA for children.